This depends on the type of yarn you're using. If you're using cotton, flax (generally plant-based) or acrylic yarn, it's enough to tie a knot at the end. 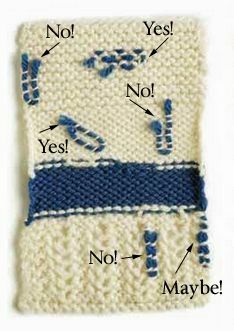 Knots made using wool yarn may get undone, so you should do a bit of weaving in the ends. If your yarn is labeled as hand-wash only, it will felt if treated with high temperature and friction. This is actually advantageous for ends - with use and wear the ends will felt gently into the fabric, so you only need to weave in a short bit of the yarn. Superwash wool will not felt, so you need to weave in a longer end. The upper part of this illustration shows how to do it in stocking fabric and lower part's 'no' would work well with ribbed fabric. Cut your yarn about two inches (5 cm) away from your last stitch. Pull the yarn through an inconspicuous corner and tie an knot on itself. Weave in the end (Tie a knot or two more if it feels insecure). Cut your yarn about an inch and a half to two inches away from your last stitch. Split the yarn into two strands, push them through a gap and around a stitch, one strand in front and one in the back, then tie a strong knot and weave in the ends.